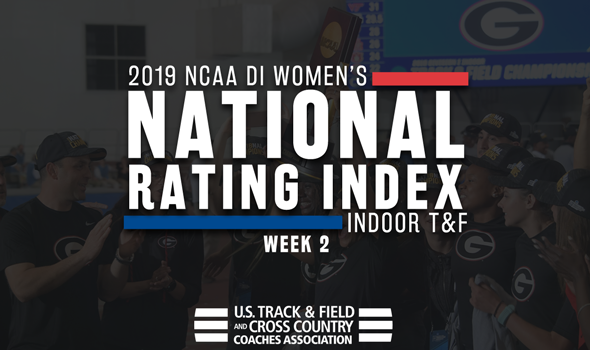 NEW ORLEANS – While the top program in the country might have remained steady for another week, that didn’t mean the rest of the chart didn’t see major changes in the latest edition of the NCAA Division I Women’s Indoor Track & Field National Rating Index, released by the U.S. Track & FIeld and Cross Country Coaches Association (USTFCCCA) on Monday. The top-5 of the National Rating Index saw two new teams enter the ranks while nine of the top-10 and 22 of the best 25 programs experienced movement. For the third consecutive week to open the indoor season, the Arkansas Razorbacks continue to sit atop the country, this time with 200.72 points. The group is fresh off a victory at its Razorback Invitational as they continued their stellar start to the year in front of the home fans. Top times recorded this weekend came from the nation-leading 4×400 relay team (3:31.26), school record-breaker Kiara Parker (currently third in the TFRI Individual Rankings in the 60 at 7.15), Payton Stumbaugh-Chadwick (sixth in the 200 of the TFRI at 22.97) and Desiree Freier (sixth in the pole vault of the TFRI at 4.41m/14-5 ½). It is the first time that Arkansas has started the season in the top spot for the first three weeks since the 2016 season. Advancing five spots to No. 2 was Southern California with 131.54 points to move back into the top-5 following an impressive showing at the Texas Tech Classic. Top performances of the weekend belonged to the 4×400 relay team (currently second in the nation at 3:31.25), Chanel Brissett (fourth in the TFRI Individual Rankings of the 60H at 7.98), Twanisha Terry (fourth in the TFRI Individual Rankings of the 60 at 7.17) and Kaelin Roberts (seventh in TFRI Individual Rankings of the 400 at 52.25). The rating sets a new program best for the Trojans, besting the previous high of No. 4. Moving down just a single spot was No. 3 Texas A&M who came in with 113.60 points. The Aggies had a strong weekend as they stayed in the state of Texas for the Texas Tech Classic. Multiple athletes secured victories at the meet and the top times to come out of it for the national scene was the 4×400 team coming in third in the country (3:31.57) and Brenessa Thompson now slotting in 12th of the TFRI Individual Rankings in the 200 (23.02). Jumping up two was No. 4 Florida who came in with 97.01 points. The Gators competed at the Razorback Invitational and were led by the 4×400 relay team (currently eighth in the country at 3:34.59) and Natricia Hooper (ninth in the TFRI Individual Rankings of the triple jump at 13.23m/43-5). It is the best mark for the program since the 2016 season. Rounding out the rest of the top-5 was No. 5 Texas who experienced a small drop of two from the previous ratings. The Longhorns registered 95.69 points and athletes competed at both the Houston Invitational and the UW Invitational. The best from the group was ran by the DMR team who posted the eighth best time in the country with a 11:11.04 performance. Completing the reset of the top-10 was No. 6 Oregon (94.38 points), No. 7 Florida State (90.10), No. 8 New Mexico (89.24), No. 9 Georgia (88.78) and No. 10 Kentucky (84.67). The program that saw the biggest improvement in the top-25 was No. 20 BYU who shot up 22 spots from the last ratings. No. 24 Michigan also experienced a large rise, improving 10 spots from its previous rank. Overall, the largest gains in the nation belonged to No. 34 Oklahoma State (up 49 spots), No. 83 Norfolk State (up 37), No. 54 Missouri (up 27) and No. 28 Houston (up 25). The next National Track & Field Rating Index will be released on Monday, February 4.